This photo captures Frazier’s playfulness. What it doesn’t tell you is what a fantastic fiddler he was. 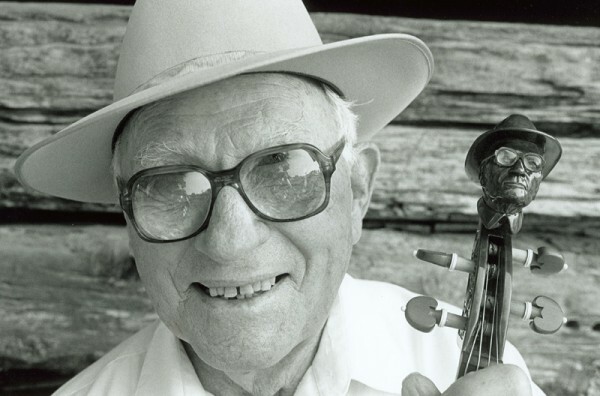 Living in Cookville, TN most of his life, Frazier won just about every fiddle contest around including the National Fiddling Championship, the Southeast Fiddling Championship and the Tennessee Valley Old Time Fiddlers’ Association championship. He played in a hard driving, complex yet swinging style. Frazier was one of the people that brought the Texas long bow style to Tennessee. Frazier loved to play with young folks and when you played with him you had to play at the top of your game because he played fast and hard. He never played a tune the same way once. He made music fun. An amazing thing about Frazier was that late in life he had a series of strokes. Most folks would have given up their music, but not Frazier. He knuckled down relearned the instrument…not once but several times.